A Canadian shipment of relief goods bound for storm-ravaged Oklahoma has been stopped at the Canada-U.S. border in Windsor, Ont. American officials will not allow the 20,000 kilograms of food, blankets and diapers into the country until every item on board is itemized in alphabetical order and has the country of origin of every product noted. Dennis Sauve, the volunteer co-ordinator for Windsor Lifeline Outreach and the food bank co-ordinator at the Windsor Christian Fellowship, the two organizations that gathered the goods, said it's a "physical impossibility" to do the paperwork required in time to get the perishable food to Oklahoma before it spoils. 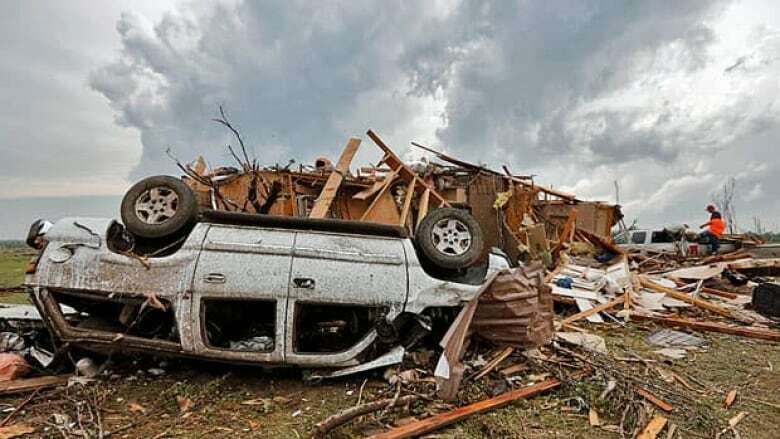 A tornado three kilometres wide ripped through Moore on May 20. The twister killed 24 people and injured close to 400. It destroyed 1,200 homes and damaged another 10,000. Sauve's group secured skids of food donated from Heinz Canada, a refrigerated truck from ADT Transportation and fresh fruits and vegetables from a number of greenhouses in Leamington, Ont., southeast of Windsor. "It was very rapid. By the hour it was swelling up in size. We were absolutely thrilled to be able to do this," Sauve said. "I had no dream at all it would be this difficult. I never dreamt we would be called to the table on being able to give this food to people in need." The shipment was to be sent to the Gate Church or Oklahoma City, about 20 minutes away from the devastation. Bishop Tony Miller called the hang-up "very unfortunate." He said his church has been waiting to receive the goods all week. "We were excited that our friends internationally were willing to send resources. They worked hard to put it together," said Miller, when reached en route to Moore on Friday. The truck was originally scheduled to leave Wednesday. Instead, it's parked in Leamington. "They were kind of shocked at how much we were able to get together," Sauve said. The truck was loaded with so much food and supplies, it was initially overweight and volunteers had to remove skids. Sauve said U.S. agents have asked to physically inspect the produce and two skids of rice, donated by Dainty Rice in Windsor. In an effort to help the shipment pass through customs, Dainty Rice provided paperwork and NAFTA certificates for the rice. As of Friday, the truck still had not pulled out. Sauve said the U.S. Food and Drug Administration is now asking for documentation of every item on the truck, including manufacturer's documentation and country of origin before it will approve the shipment as "safe for consumption." "That documentation for us would be an impossibility," Sauve said. He is now worried the fresh food, picked on Wednesday, will soon spoil. "We're holding our breath and saying our prayers," Sauve said. Miller, meanwhile, has asked his congressman for help. He emailed U.S. Congressman James Lankford, who in turn raised the concern with FEMA and U.S. Customs and Border Protection. "That's not something that ever crossed my mind, that we'd have these issues," Miller said. "Especially when it's coming from reputable people. "They only had the heart to help people." A previous version of this article said the truck was held at the U.S. border because U.S. President Barack Obama had not declared Moore, Okla., a disaster area. In fact, Obama had declared a disaster area May 20. 2013. The truck arrived at the border Friday morning and cleared Saturday at 8 p.m.